We had such a positive response with this feature that we thought we just had to bring it back. So what have we been pinning lately? Everything Mexican, that's what. This trend is on the up, up, up! We love everything about this culture; from the delicious food to the bright colours and patterns of it's traditional art. We predict a revival of all things Mexican soon - watch this space! 1 - This recipe for Chilli Corne Carne from the Pretty Blog looks just too good not to try. 2 - Ever since we saw Alice make Churros on Masterchef Austraila, we've been dying to try our hand at them. This recipe from the Mexican food blog La Cocina de Leslie looks great to try out. 3 - This illustration is everything Mexican to us - we love the bold colour palette. 4 - The Day of the Dead festival is one of the most celebrated of Mexican traditions. With a sugar skull painted face and flowers in your hair, you'll be ready for any Mexican fiesta. 5 - Everything about this photograph works - the mixed patterns, the soft pink contrasted with the mirrors and crosses and of course the Frida Kahlo inspired hair. 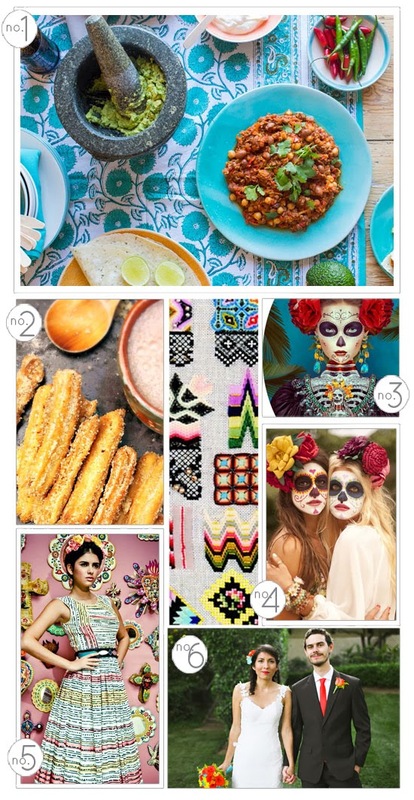 6 - We loved the look of this of Mexican inspired wedding - fun colours and a great festival feel.